An excellent study of character and the impressions we give to children. Acting was very good, Bill Nighy, Emily Mortimer and Patricia Clarkson. The whole cast was very good. 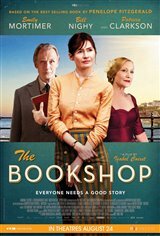 "The Bookshop" is a very sensitive and touching British film with excellent performances by Bill Nighy and Emily Mortimer. It is so refreshing to see a dramatic film totally void of special effects, loud noise and juvenile humor. The Brits are making great films while Hollywood is going overboard with comic book films,.lousy scripts and lazy acting. Go see this one! Produced and presented with the usual English flair for sensitivity and under-stated acting skill. Not the usual USA over-boiled rubbish. An excellent story - well-paced. Very touching drama, Bill Nighy is amazing (as always), as well as the other actors. If you haven't seen this movie yet, don't miss your chance.